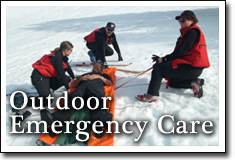 Outdoor Emergency Care® (or "OEC") is the NSP’s training program for patrollers and others in the recreation community who deal with emergency situations. This program is designed to help you manage emergencies in all seasons. While the main focus of the program is on winter emergencies, if your mountain uses Ski Patrol for medical care all year round for events such as Obstacle Course races or Mountain Biking, you will learn how to handle these warm weather emergencies as well. Developed in the late 1980s for the 26,000 members of the National Ski Patrol, Outdoor Emergency Care is a training program that is tailored to the nonurban rescuer. The courses taught in the SNY region will use a combination of in classroom learning for skills practice and online learning for lectures and quizzes. The official textbook for the course is Outdoor Emergency Care 5th edition, published by Brady Books. Visit the National Ski Patrol page for more information. For learning resources, powerpoint presentations, skill guides and more, visit the OEC section of our paperwork page.